If you go to You Tube and search Chris Gollon monotypes or cut and paste this link http://www.youtube.com/watch?v=Re7PMzGEReQ, you will find a fascinating film of Chris Gollon making monotypes at the Goldmark Atelier in 2007. His techniques are so innovative that the film has 40,000 views. 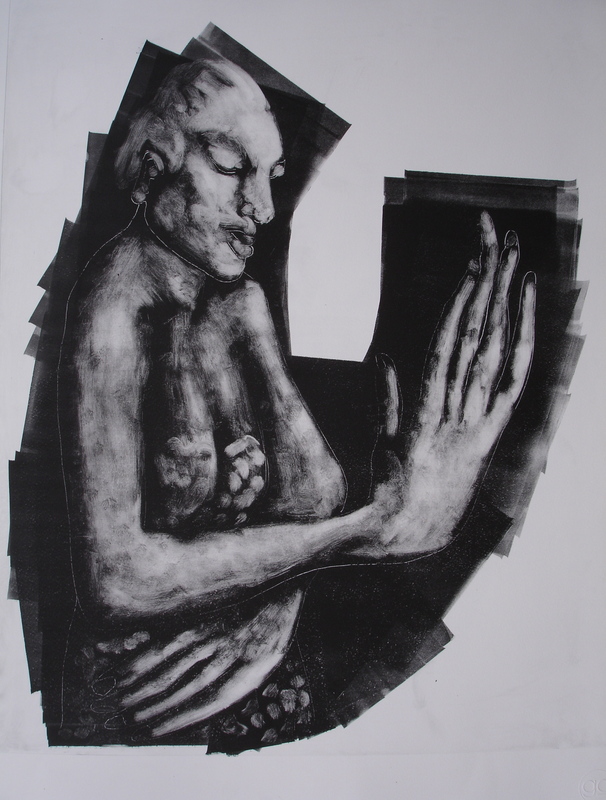 This monotype is on 300g Arches paper and was made in 2007, and was made at the same time as the above-mentioned filmed visit to the Goldmark Atelier. The name Gollon gave to the monotypes he made over those 3 days is The Basement Tapes, after Bob Dylan's experimental tracks of that name. Gollon felt as though with ink, sprays, rollers, rags and fingers he was 'jamming' too, and the images he made are very original.